runaway sentence. : A-Z Challenge for #25! A bunny can’t drive every fish. Qwerty reality! That's a hashtag waiting to happen! These were a lot of fun to read, but I know they took a lot of hard work and imagination to get just right. Three cheers for the Nyancat. God I laughed my socks off on these, Marian--not yours, which was just cool, but the kids' which were so hilarious and creative--are you sure that ' Silly tie-dyed underpants/versus wet x-rays/yet zero....'wasn;t stolen from Bukowski?? Is Nyancat made from a pop tart? Anyway, thanks for making my day. They're all brilliant! I so love the way you involve your kids in this — and obviously they do too. I love the Nyancat. I, too thought he looked like a pop tart or is he pizza! 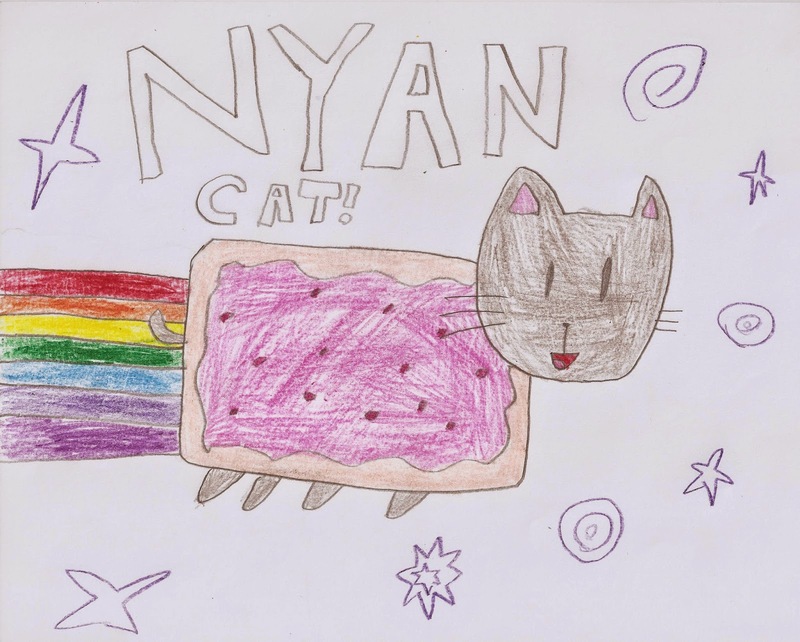 Nyan Cat is a poptart, and my kids did not invent him or her, though my son drew that picture. Nyan Cat is a youtube sensation!